Krokus founder Chris Von Rohr is in search of the ‘craziest dogs in the world’ to be part of a the band’s upcoming video. Nearly 40 years after their creation, Krokus is back on top of the Swiss charts at #1 during the first week of release of their new album ‘Dirty Dynamite’. For their new video, “Dog Song”, the Swiss rockers from Solothurn are looking for the best dog videos worldwide. 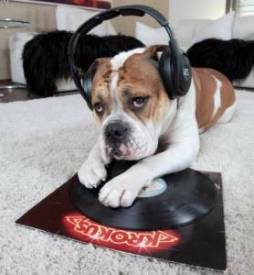 These will be integrated in the official music video around the new band mascot, the English Bulldog named ‘Da Dog’ who is pictured on the “Dirty Dynamite’ album cover. Interested parties can send their dog’s funniest videos to gewinnen@ringier.ch (Subject: KROKUS) and the band will select from all submissions the most original ones.